Rosata, the widow of Mariotto di Ludovico, established a community of Franciscan tertiaries here in 1490. When she died in 1509, she left all of the goods of the community to that of San Quirico. By the time of the Apostolic Visitation of 1573, the community at Sant' Antonio had regained its independence but was in great poverty, and the remaining sisters were forced to move to San Quirico. 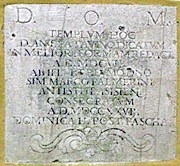 An inscription on the façade of the present church records that it was built in 1607. In 1612, Bishop Marcello Crescenzi arranged for the complex to be given to a the Third Order Regular of St Francis. This community also acquired the church of Santa Maria sopra Minerva in 1613. The order maintained both establishments until 1758, when they sold the latter church and became concentrated at Sant’ Antonio. The community was suppressed in the 1810 and again, this time finally, in 1860, when some of the brothers moved to a house in Via San Paolo. (It finally moved back to Santa Maria sopra Minerva in 1918). The church and convent at Sant Antonio were adapted in 1990 to house a school. (It is possible to visit the Roman remains when the school is open). The following works are now in the Pinacoteca Comunale. This panel was documented in Sant’ Antonio da Padova in 1869, and associated with a preparatory sketch by Giacomo Giorgetti. It was subsequently moved to the cemetery church at Palazzo, outside Assisi. It was restored in 1989 before its move to the Pinacoteca Comunale. This panel, which is attributed to Antonio Circignani, il Pomarancio, depicts the Virgin with SS Antony of Padua, Francis, Clare and Mary Magdalene.